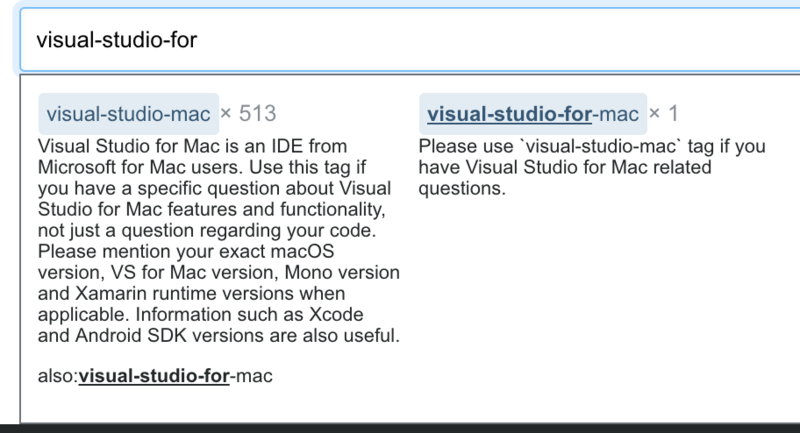 When I was posting a question with visual-studio-mac I noticed that visual-studio-for-mac was a suggestion. Being diligent to clean the only question tagged with visual-studio-for-mac question up, the tag page redirected me to visual-studio-mac. I confirmed there is an existing synonym for it which was created in November 2017. Hence either there's some caching (that'd be a long cache window) or some bug in the tag selector query. There was one question that had the old tag: sgen TypeLoadException in Visual Studio for Mac when trying to build Xamarin.iOS app. This causes the tag to not get deleted, and then it still shows up as a suggestion. I've retagged that question now. As Stijn commented here, a merge is separate from a synonym, and apparently as long as the tags aren't merged, the synonym tag doesn't get deleted, and still shows up as a suggestion. Not the answer you're looking for? Browse other questions tagged bug tags tag-synonyms . How to reverse a tag conversion? A tag created 9 hours ago has 1 question and 3k followers?